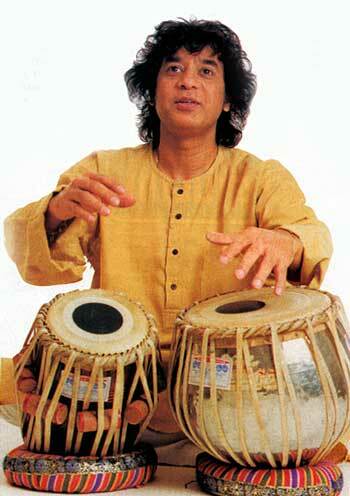 Hindustani classical music is the North Indian style of music found throughout the Northern Indian subcontinent. it is a tradition that originated in Vedic ritual chants and has been evolving since the 12th century in areas which included mainly North India and Pakistan and to some extent Bangladesh, Nepal and Afghanistan. Today it is one of the two parts of Indian classical music, with the other one being Carnatic music, which represents the music of the South. The music is very complex and if you are completely new to Indian music, bare with me, I will do my best to explain what I have learnt so far. The Indian musical system relies on the notions of RAGA (melody) and TALA (Rhythm). Before we continue, at this stage you really need to have a tanpura (Indian drone - pictured left) and a tabla (Indian drum - pictured right) for your practice to make sure that you are playing in tune and in rhythm. 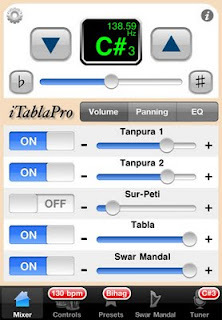 Most people do not have easy access to players of these instruments, so I would suggest you either download a program for your computer or for your ipod or iphone (with speakers) - usually these cost a little money but if you are planning to play the bansuri often, this is worth the investment and it will help you with your practice. Your tanpura needs to be tuned according to the key of the flute you are playing in. So if you are playing with an E bass flute, your tanpura must be tuned to E. By playing Sa on your E flute, it should sound in tune with your tanpura tuned to E. Likewise, if you are playing with a flute in the key of C natural, you will need to tune the tanpura to C natural so that when you play Sa on your C natural flute, it will be in tune also. It is difficult as a beginner to know if you are playing exactly in tune. When you tune the tanpura with your flute, try changing the tanpura, for example if you are using a G bass flute and you have just tuned your tanpura to G, try changing the tanpura to F and then play Sa on your G flute. You will notice that it does not sound quite right because it is out of tune. If you still do not notice this, do not worry. Your ears will adjust in time. Just be patient. In any case, your ears will adapt with time and soon you will understand if your tanpura and flute are in tune. You will also begin, in time, to understand that various actions change the tuning of the flute, for example, the angle you are blowing into the flute and the amount of air you are blowing into the flute. Sometimes your flute may be perfectly in tune but you might think it is out of tune because of the angle you are blowing into the flute. remember if you roll the flute towards your lips, this lowers the pitch. If you roll the flute away from your lips by twisting it outwards, this raises the pitch. This if very difficult to explain, but I will do my best here. The word "Raga" literally means "what colours the mind" and often in music books you will find all kinds of heavy worded and poetic descriptions, however for the sake of helping you understand what a raga is, I will explain it as simply as I can at first before giving the more complex descriptions. It is important also to know that there are hundreds of ragas - all with different names, some are more common than others. A raga is basically a melody produced by playing a set of specific notes and adhering to certain rules. Each raga, which is always improvised in Indian music, gives a different feel. So one improvised melody might make us think of romance, another might make us feel very calm and another might make its listeners feel sad. Imagine someone saying to you "Ok so now you can play on the bansuri the normal notes; Sa Re Ga Ma Pa Dha Ni Sa, but now you must only play specific notes and some notes you must not play at all". The natural scale of the bansuri is Sa Re Ga Ma Pa Dha Ni Sa (excluding half notes) - but when we play different ragas, we select only some of these notes. For example Raga Bhupali uses the following notes ascending: Sa Re Ga Pa Dha Sa and descending Sa Dha Pa Ga Re Sa (Note that with Raga Bhupali the notes are the same ascending and descending but this is not the case with all ragas). You will notice in this Raga Bhupali that Ma and Ni are omitted (not played at all). So instead of playing SRGMPDNS, you play SRGPDS. So we now know that Ragas consist of certain notes which must be played and other notes which must be omitted. The next thing you need to know is that some notes have more importance than others. So with each raga, there is a VADI (a ruling/king note) and a SAMVADI (a vice-ruling/queen) note. For Raga Bhupali, the vadi (most important note) is: GA and the Samvadi (Second most important note) is DHA. So when a musician plays Raga Bhupali, he or she will play these notes longer or may start or stop on these notes. 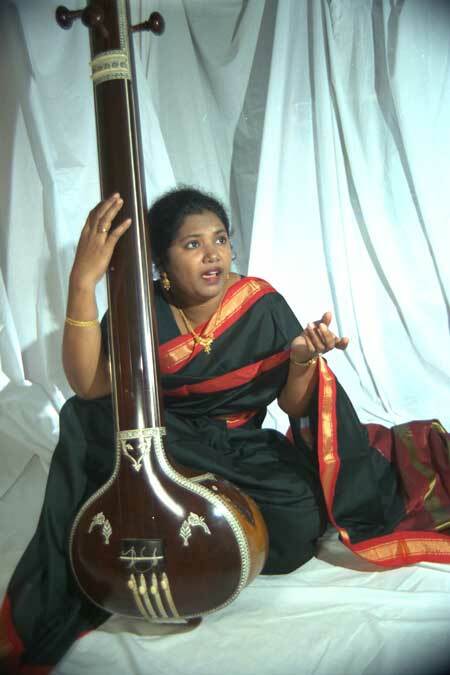 Furthermore, ragas are traditionally played at different times of the day. Some ragas are played in early morning and other in the evening after sunset etc. Nowadays these rules are not always followed however. Raga Bhupali is traditionally played in the evening between 6pm to 9pm. As I mentioned before, each raga creates different emotions and feelings. These include: Shingara (romance), karuna (pathos), hasya (cheerfulness & humour), raudra (anger & fury), vira (courage), bhaya (fear), bibhatsa (disgust), adbhut (surprise & wonder), shanta (peace), viraha (absence or separation), madhurya (sweetness & ternderness), vatsalya (motherly feelings) and kama (eroticism) and also Bhakti (devotion). Raga Bhupali is a Bhakti (devotional) raga and creates this mood. It is also often associated with the separation of a lover. When you learn a new raga, you will learn first the Aroha (Ascending scale - notes played from bottom to top) & avaroha (descending scale - notes played from top to bottom), then you will need to know the Vadi & Samvadi and also the Pakad. The pakad refers to typical (and generally accepted) patterns of notes associated with a specific raga and which will help you to bring out the essence and full feeling of a particular raga. These notes are played over and over again throughout a performance and that is why it is important to know them. The pakad also helps players identify which raga is being played. Now - Musicians usually explain ragas in a completely different way. Pandit Hariprasad Chaurasia once said "For me, ragas are gods or goddesses, all members of a great family. I can call one of them any moment and immerse myself in its musicality; their personalities are so rich and complex that I never feel lonely". So we can see that performing ragas is much more than just playing notes, it is like painting a picture in front of an audience and trying to convey all the emotions and make a beautiful painting. The composition is divided into 2 parts. The "Sthayi" which is the first part of the composition and is a central and dominant part of the composition, played many times and which allows us to express the lower register; and the second part called the "Antara" which allows us to explore the higher register and then come back to the lower register and go back to the beginning of the sthayi. Note that in a performance, you start with Alaap - Alaap is an introduction to the raga and performers start from the low notes exploring them and playing few notes in as many ways as possible using different types of ornamentation. The performer then gradually works his or her way up through the notes, introducing the next note up but then coming back down. Every new note is generally introduced slowly before really expressing that note. Eventually the performer works his or her way up to the higher notes before finally coming back down to the home note "SA" in the lower register. After alaap, the composition begins. A player will play the sthayi several times and then begin to improvise before coming back to the Sthayi. This will happen many times: sthayi - improvisation, sthai - improvisation again and again. There will also be longer improvisations where a performer will leave the sthayi for some time but eventually come back to it. After this stage the performer goes on to the Anthara and improvises between each phase of the anthara. The performance will eventually gain in speed and become more and more intense. Conclusion: The idea is that the Alaap introduces the raga slowly to captivate the audience and revealing its beauty to the listeners. The composition then begins and the raga is developed more and more through improvisation and ornamentation. After some time the pace of the raga is increased to excite the audience and eventually the raga reaches its climax when the music is intense and finally the raga ends and the mood of that raga should have been established. 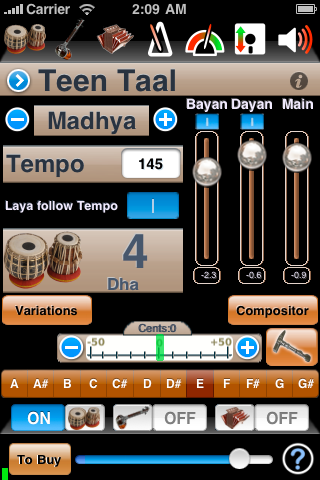 You will now need a tabla (Indian drum) or a tabla player (on computer or ipod). 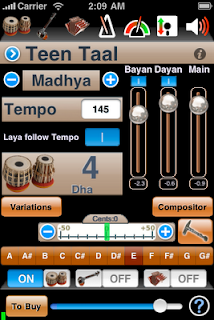 The composition below is based on Teental (16 beats are played on the tabla so if using your computer or ipod you can set this to teental). You will see below that the 16 beats are divided into 4 beat sections (this is why there are gaps between the beats in the table below) and that they all add up to 16 beats. The X means that there is a gap (no note played - a chance to breath). You will notice that there is a O and X above the composition. The O represents the 9th beat of the cycle (of the drumming) and so the composition begins on the 9th beat and returns to the 9th beat before beginning the next phrase. The X represents the "Sam"which is beat number 1. Play each line twice and conclude by returning to the first line of the Sthayi. If you are playing with a computer or ipod tabla, you will be able to see if you return to the 9th beat. If you start on the 9th beat and begin the next line on the 9th beat - then well done! you are playing in rhythm! This part of the website is still under construction. I will try to add more compositions soon. I would recommend you visit FLUTE BANSURI where you will find 2 complete compositions for 2 ragas: Raga Hamsadhwani and Raga Yaman. It is also important to get a teacher to learn with at this stage as just following the notes will not teach you all aspects of the music and how the raga should be portrayed.